News gatherers can record and stream simultaneously, or conduct interviews with low latency. 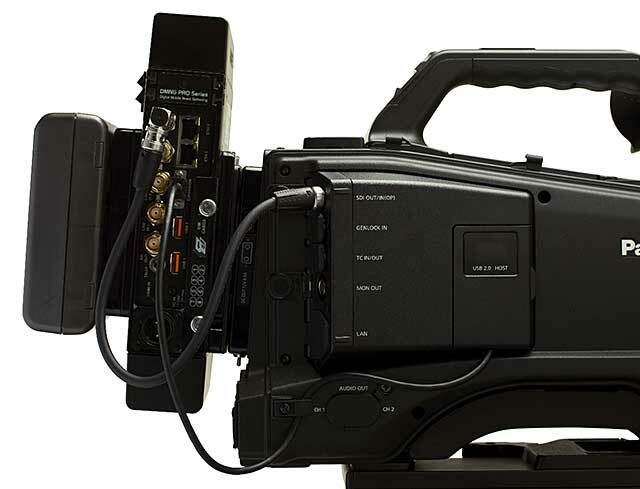 AviWest, a maker of cellular video uplink systems, announced today that it has collaborated with electronics manufacturer Panasonic on a camcorder with an integrated cellular uplink transmitter for live video. The Panasonic AG-HPX600 P2 connects with AviWest's DMNG (digital mobile news gathering) Pro cellular uplink transmitter through a USB port. With the combined system, the camera operator can control the cellular uplink through the camera's viewfinder, so there's no reason to look back and forth between two interfaces. An attached battery powers both the camera and the transmitter. Buyers can choose between DMNG Pro models with up to eight 3G or 4G modems. The transmitter includes eight high-gain antennas. Targeting news agencies, AviWest says the DMNG Pro platform streams 1080i live video, and has such low latency that reporters can conduct on-air interviews without a distracting pause after each question. The transmitter can simultaneously stream at one resolution while recording another, thanks to the inclusion of dual video encoders. At the upcoming NAB show in Las Vegas, Nevada, AviWest will show off one of four configurations of the DMNG Pro: model 110. The DMNG Pro 11 is a core version without an internal modem or custom high-gain antennas. AviWest is based in Rennes, France.